Who Should Read The Startup Survivor? 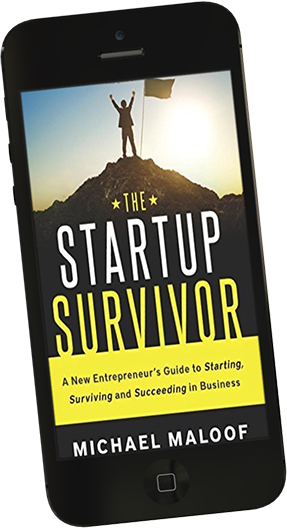 Subscribe to The Startup Survivor mailing list and you'll be the first to receive free books, special offers, and exclusive webinar access. Some battles need to be fought, but not all. Learn the difference between defending your company, and feeding your ego - it could save your business. Still Searching For Your Big Startup Idea? Read more Still Searching For Your Big Startup Idea? Read more What’s Your Theme Song? Are You Really Bootstrapping Your Startup? Read more Are You Really Bootstrapping Your Startup? © 2017 Michael Maloof All Rights Reserved Worldwide. Whether you're dreaming, planning, building or growing your startup, there are lessons in my book that will help you succeed. You can save thousands (maybe tens of thousands) of dollars, and countless hours by avoiding a few common startup mistakes. But don't take my word for it. Check out the reviews, and then judge for yourself with this Exclusive FREE Preview. You can save thousands (even tens of thousands) of dollars, and countless hours by avoiding the many common startup mistakes.